Israel considers dropping cat-spaying program because of God. 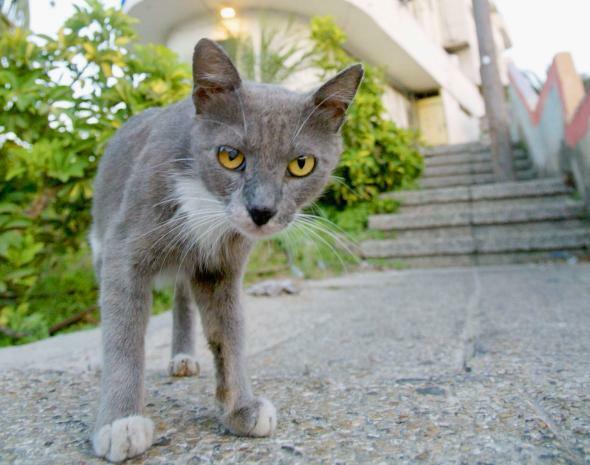 Israeli Minister Wants to Abandon the Country’s Stray Cat Spaying Program Because of God. Seriously. A stray cat in Tel Aviv, Israel. They howl, they hiss, they stalk the streets. They show up in dumpsters, under cars, and in alleyways. They are Israel’s stray cats, and they are more than just a public nuisance: They’re a menace. Until now, Israel, like many other nations, has been doing all it could to keep its feral cat population in check. As it should: Feral cats spread disease, wreak environmental havoc, and destroy wildlife. But that practice is apparently about to change after Israel’s eccentric minister of agriculture, Uri Ariel, said that he would be taking the national spaying budget and using it for other less proven measures to control the cat population. Such a move would undercut Israel’s efforts to fix what has become an acute problem in the small country. In 2013, after the feral cat population mushroomed to an estimated 2 million, the country’s Agriculture Ministry launched a mass spaying and neutering campaign to prevent the growth of future populations of street cats. The program, like similar ones in other countries, was meant to reduce the environmental and health hazards that cats cause, as well as the suffering of the cats themselves. This year, though, Israel will reportedly not be spaying or neutering its stray cats. Instead, Ariel has said that he will take the $1.16 million cat control budget and put it into research on spaying and neutering alternatives. Ariel says one proposal was to put money into research for “a spray or powder that would stop the males from smelling the females,” the Washington Post reported on Monday. The scientific feasibility of such a proposal could not be determined as of publication time, but needless to say the effectiveness of such ideas are unproven. This, of course, is insane. A stray’s life is nasty, brutish, and short. If a stray cat in Israel doesn’t die from the mundane fact of starvation, he will likely perish from wounds suffered during a cat fight, getting cut on the jagged lid of a can, a urinary tract infection, feline herpes, dehydration, or getting hit by a car, according to the nonprofit Concern for Helping Animals in Israel. The average stray cat’s lifespan is a scant one to two years. Fortunately, the cat deportation scheme was vetoed by the ministry’s chief scientist, Avi Perl. But that hasn’t stopped the rest of Israel from responding angrily to Ariel’s ridiculous approach. Fellow politicians and Environmental Ministry officials, not to mention animal rights activists, are furious. Animal rights nonprofit “Let Animals Live” was planning a protest at the country’s Supreme Court on Tuesday, according to Haaretz. Hopefully the uproar is enough to put the anti-spaying campaign to bed.